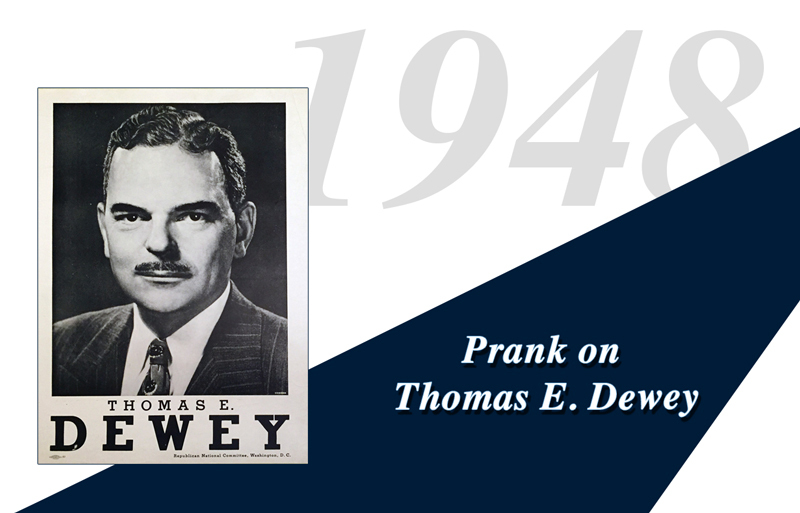 Thomas E. Dewey, the Republican nominee for President in 1948, is a friend of Wheeler Sammons, who is known to have a hearty sense of humor. As the election nears all the polls show Dewey with a solid lead over current President Harry S. Truman. The Chicago Tribune is so sure that Dewey would prevail that on election night, they run a headline, DEWEY DEFEATS TRUMAN. But by the next morning, it is clear that Truman has won re-election. Sammons though runs a special biographical sketch of Thomas Dewey, binds it into a single copy of Who’s Who in America, and sends the book to Dewey. The heading of the biography read, “DEWEY, Thomas Edmund, President of the United States.” No records exist of Dewey’s reaction, if any, to this prank.